Yes, this is an actual cookie. Get excited. I acquired this gem through a co-worker at the LA fair and it is VERY rich considering that you are using a pound of margarine. However, with everyone being into salted caramel, salted chocolate, and the classic chocolate covered pretzels, I figured this might also subdue those sweet and savory cravings we all get. SO! Let's get started then shall we? It's super simple and most of these ingredients (pictured below) you probably already have in your kitchen. Note: This recipe does NOT call for salt because you will get all your saltiness from the potato chips. Ok, so the hardest part of this recipe is in the very beginning when you cream the butter with the sugar. My co-worker told me not to use a mixer so I used a wooden spoon, HOWEVER, if I had to do it all over again I would definitely use a mixer and not even think twice. Also, it will be a huge disaster if you use a whisk because the butter gets all caught up in the middle and you'll be pushing it out with spoons and your fingers. It's a mess and hassle you don't need, you've been warned. Mmmmmm butter and sugar... Anyways, now you'll need to grab a large gallon ziploc bag and fill it with Lay's potato chips. Don't worry about measuring it right out of the bag just make sure all the air is pushed out and it is sealed tightly. Now get your rolling pin and if you don't have one then you can use the bottom of a heavy drinking glass or your hands. Gently glide the rolling pin over the bag back and forth to crush the chips, but not into dust, just into the size you might find at the bottom of the bag. You know, when you pour it into your mouth to get every last salty bite. 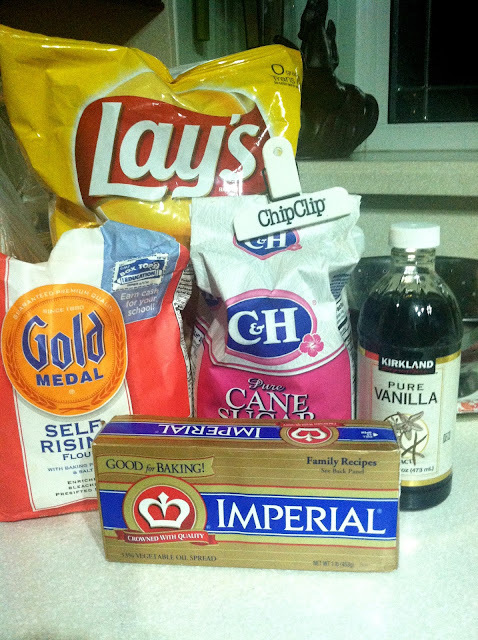 Now that you have a beautiful bag of chip pieces, dump them into your butter mixture after the flour and vanilla. 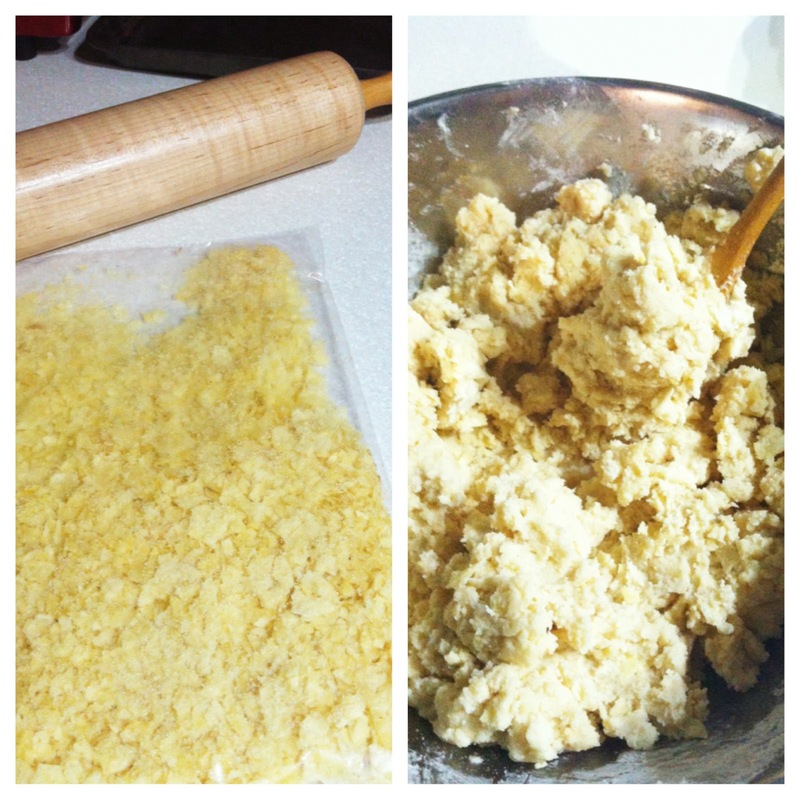 Your final dough product should look like the picture shown below. Just a bowl of chunky, yellow stuff. 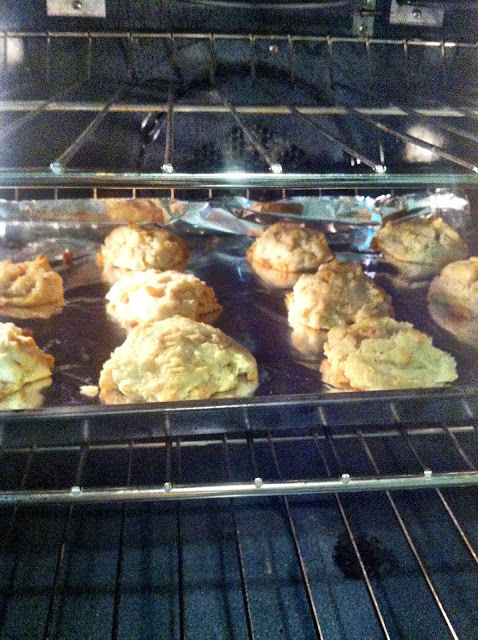 Now all you have to do is scoop them into golf ball sized dollops and bake for 20 minutes. When you see the edges start to get golden-brown, it's time to take them out! 1. Preheat your oven to 350 degrees. Use foil to cover a regular sized baking sheet. 2. Using a wooden spoon or electric mixer, cream the butter and sugar together in a medium sized bowl. 3. Use a gallon sized Ziploc bag and fill it with your potato chips making sure it is sealed tightly with no extra air inside. Using a rolling pin or your hands, crush the potato chips into all different sizes (just not into dust). 4. 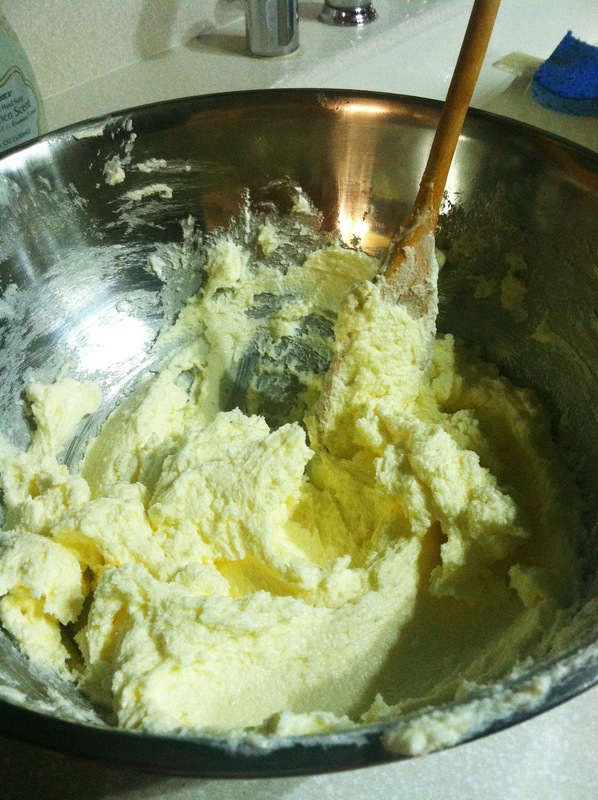 Add your flour and vanilla to your bowl of sugar and butter and mix thoroughly. Now dump in your two cups of chips and continue mixing. 5. Scoop the dough into golf ball size scoops about 2 inches apart from each other and bake for 20 minutes. Recommendations: Dip your cookies into melted chocolate or sprinkle them with powdered sugar if you really want to get fancy.